It was hot, and humid, and threatening to storm. Perfect weather for catching our first honeybee swarm. 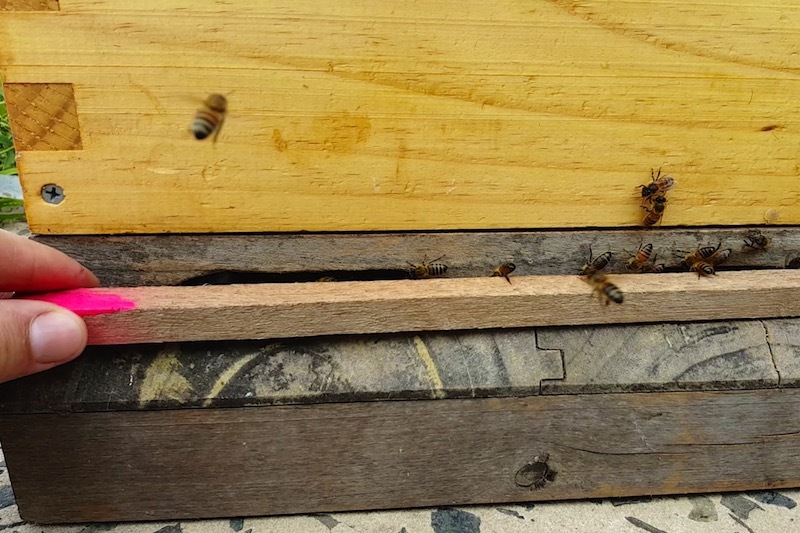 We got the alert via our friends Adam + Fiona of Buenavista Farm – the usual bush telegraph story – someone called them about a swarm on a driveway, but Fi + Adam were packing for market day and had no spare bee boxes, so they called us. Thanks, guys. 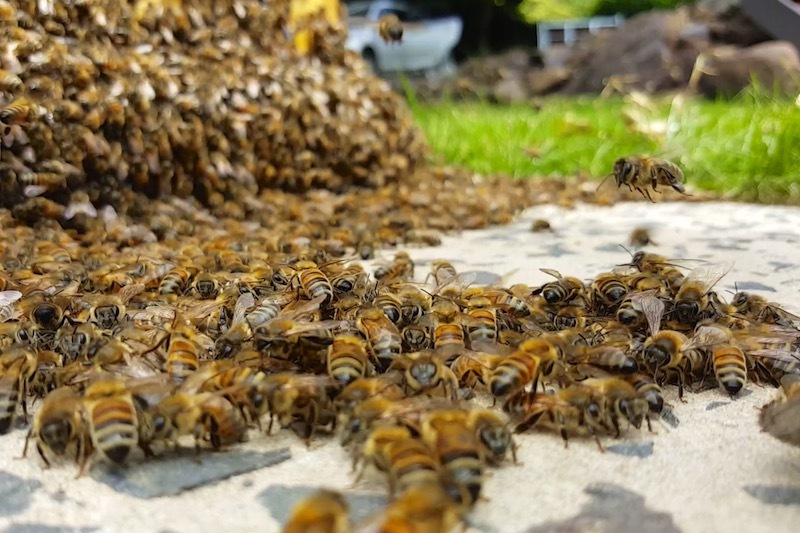 A swarm parked on a driveway may well be the easiest swarm catching event of our lives, so we’re glad it was the first one. We weren’t entirely prepared with all the bits we wanted, but we had enough to get by: a warré box with empty top bars, a bottom board, a lid. 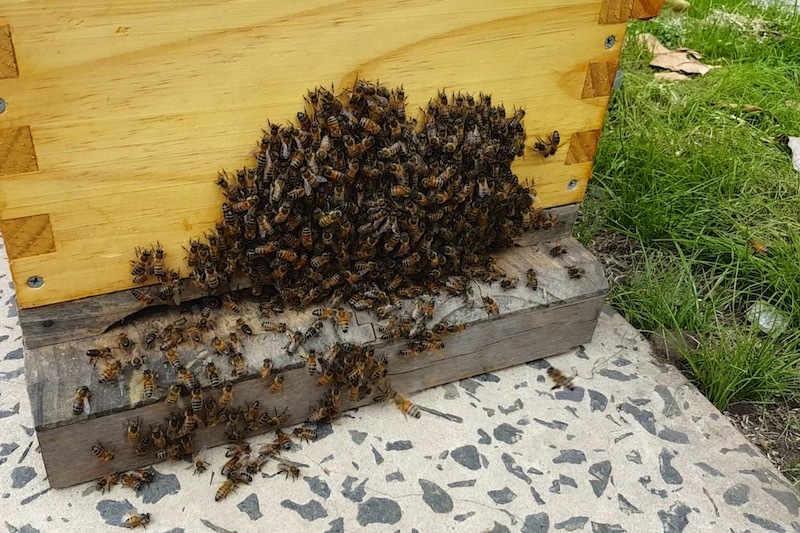 So Nick placed the box by the swarm on Linda’s driveway, and let the scout bees decide if this new home met their colony’s requirements. 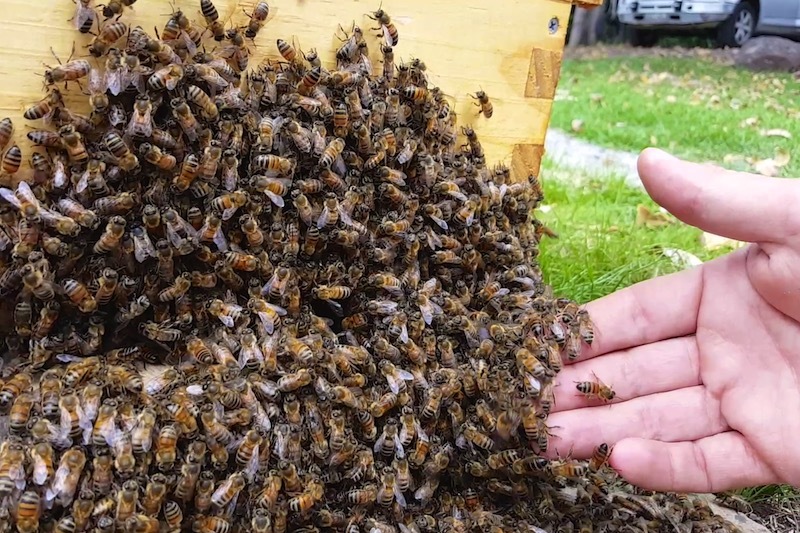 This swarm might have a virgin queen (unusual but possible) – in which case the queen is much harder to distinguish from the other bees, until after she has mated, which she will do once they reach their new home. Once they were all inside, Nick placed a small bit of wood over the entrance, and high-tailed it to our apiary at Buena Vista Farm. So calm - they've got better things to do than sting just now! Ok maybe except for that one - ow. 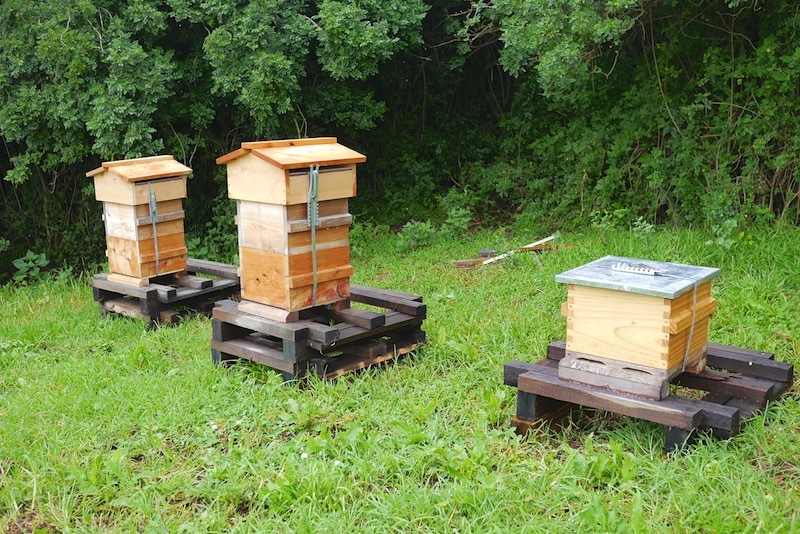 Once there, he quickly set up a level pallet for the hive to go on next to our other recently installed Warré hives, and put the box in position, and then removed the piece of wood so the bees could fly free. The next day was wet, cold and rainy, so the ladies weren’t flying much. 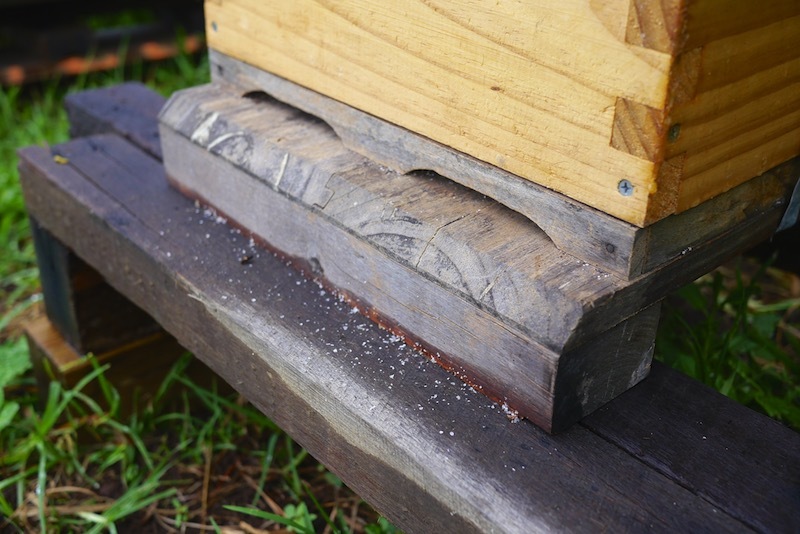 But I could see the white flakes of wax that denote comb production at the entrance of the hive, so we’re taking that as a good sign that these bees are setting up home immediately. White flakes means comb production - yay. In the next week we’ll top their box with a Warré quilt box for extra insulation, and work on a gabled roof. 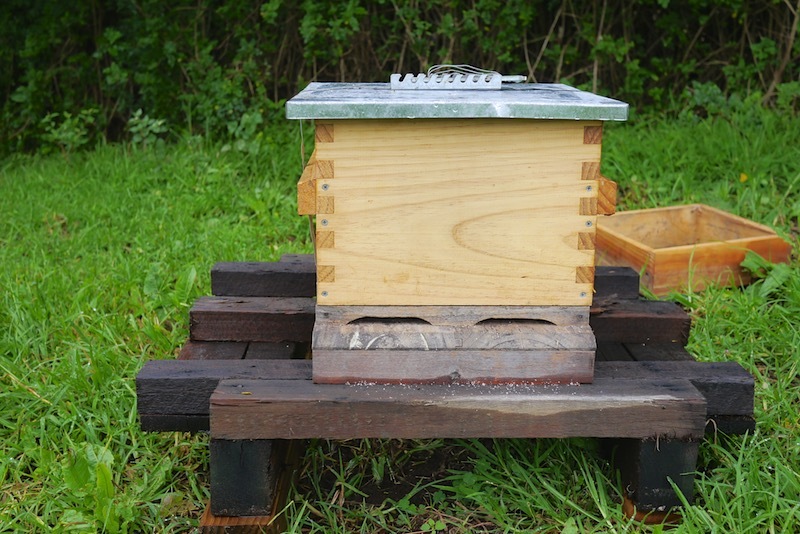 We’ll also add a bottom board to the hive with a build-in small hive beetle trap, as this region has plenty of those suckers and we’d like our bees to have a healthy home. 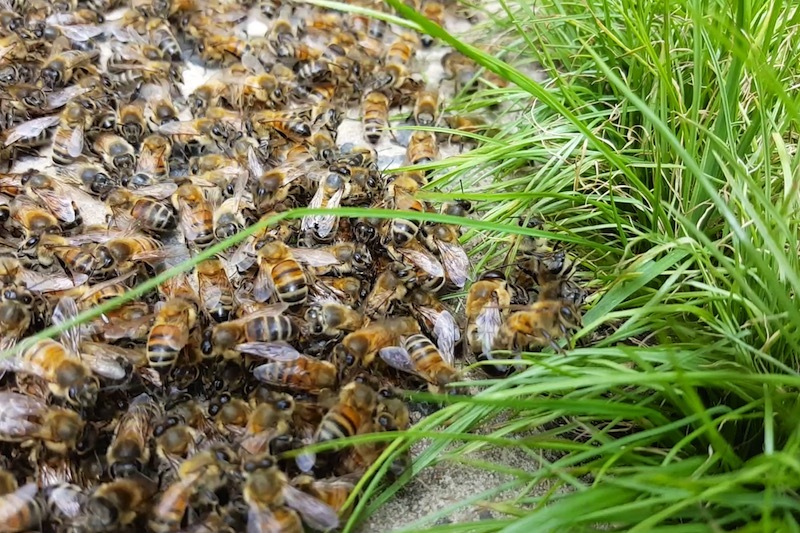 And we’ll watch the entrance activity, and observe, and observe – within 4 weeks or so, we should see the bees bringing pollen into the hive – which will mean that the queen is successfully laying (pollen is food for baby bees). What a buzz! 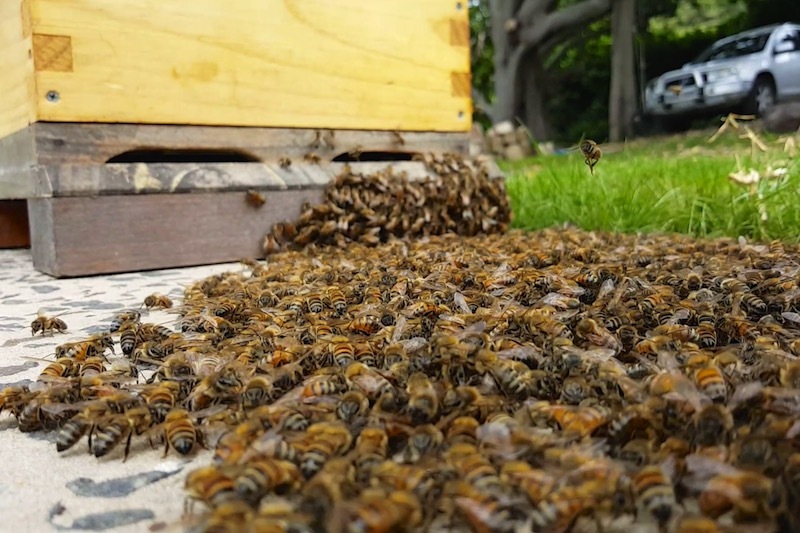 As swarming is how bees naturally reproduce on a colony scale, we’ve now got locally adapted + resilient bee genetics in our apiary – which is great for this hive, and for our others also. 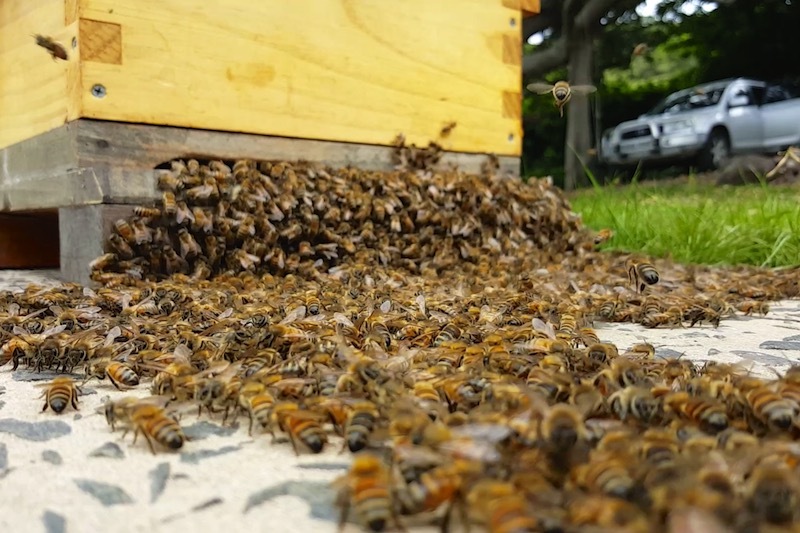 Here’s a video Nick shot while the bees were making their way into the hive – there’s some serious waggle dancing at 14:31! Having fully-prepped hives all ready for swarms would be great, instead of a half prepped one. 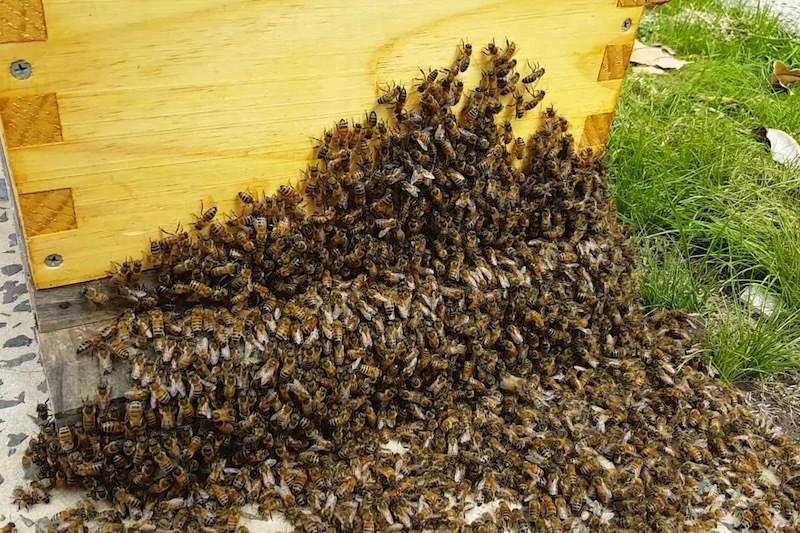 Finding a swarm on the ground is rare – but if you do, you could scoop them up in a big dustpan and deposit them in the top of the hive and let them make their way down into the box. 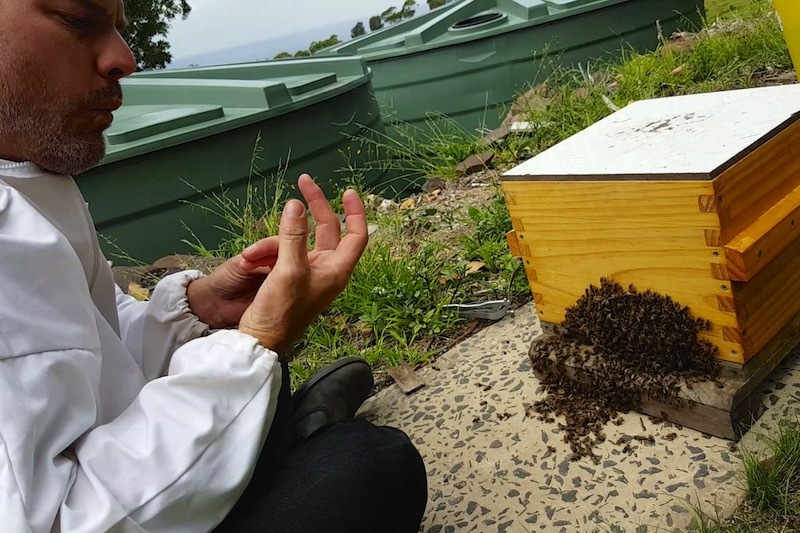 Thanks to Adam + Fi for passing on the swarm call, and to Linda for calling her local farmers instead of the pest exterminators. Healthy bees means healthy us! 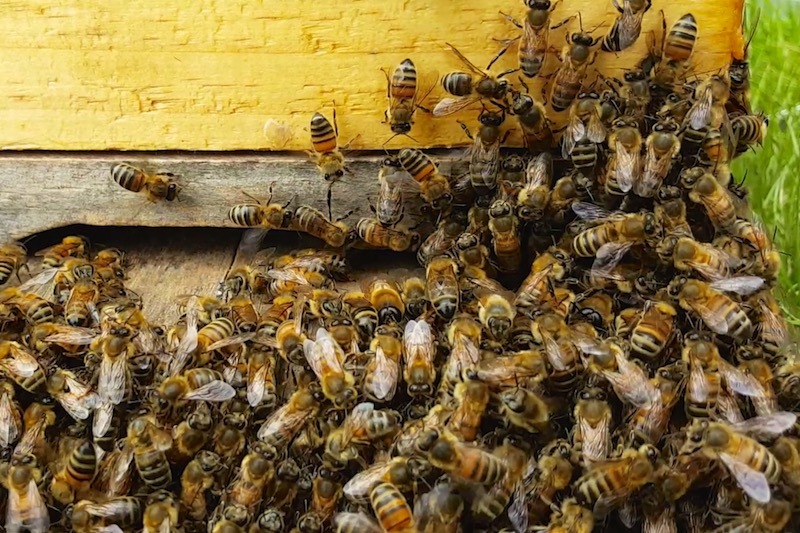 If you have a swarm and aren’t sure who to call for help, call your local council or your local Beekeepers Association, who will usually have a swarm catching list. That’s surely the easiest catch ever. Talk about cheating! Where’s the need for a huge ladder? Or disentangling bees from within a bush?